Yesterday around mid-day, we motored into our new home port, our sailing adventure complete…for now. It was the best sailing of the whole trip and we made the most of it. Coming across the Outer Gap near Amherst Island, the swells were 3-4 feet but the winds were strong and steady enough that our trusty boat cut through them. What a ride! It was exhilarating and the perfect way to end our 17-day adventure. The boat is now docked at its new slip but the adventure didn’t end there. After we packed everything into our car (it had been patiently waiting for us at the new marina), we headed home…only to hear a strange sound and see a warning light on the dashboard. Flat tire. A nail had punctured it. So instead of going home or even getting lunch, we headed for the car dealership. Luckily they had the tire in stock. Several hours and several hundred dollars later, we were finally on our way home. As I write, it’s pouring rain. Much needed given how dry everything is. Yet I marvel that, in the last two days of the trip, when thunderstorms and heavy rain were in the forecast, we sailed on, blue sky and sunshine above us the whole time. May you find blue skies on your life’s adventures too! This photo gives you the feeling that it’s a calm and relaxing day on the water, doesn’t it? This is a view of Picton Bay with our sailboat in the foreground. It was taken after we motored in this morning from our anchorage the previous night. What it doesn’t show is the whitecaps, strong gusts rippling across the waves, and the power of the wind sending our boat on edge even with no sails up as we made our way across the Adolphous Reach and into Picton Bay. We decided at that point that we didn’t want to face those waves head on in the Reach to make our next planned anchorage. Instead, we have a slip here for two nights while we wait out the winds (and forecast rain and thunderstorms). To give you a better idea of the extent of our sailing journey, here’s a chart of Lake Ontario. The pencil on the left shows where we started. The pen in the middle points to where we are now, and the pen on the right is our final destination…for now. We’ve come a long way. And every sailor we meet is giving us new ideas for places to go, adventures to have, dreams to build upon! Living on a boat, especially a small boat, is a lot like living in a tiny home. You learn to make do with less and everything has multiple purposes. The kitchen (called a galley) on our boat is a small L-shape. Barely enough room for one person so we take turns on cooking and dishes duty. Behind the tiny sink is the ice box (which we must continually replenish with ice and drain out the melted water). Beside that is the drying area for dishes. When not used for that purpose, the shelf comes off revealing a two-burner stove. Sailing is also a lot like camping. The dining room is a table that folds up or down as needed. The living room is our cockpit. And the bedroom is the v-berth at the bow (front) of the boat. We pull out those pillows, and the sleeping bags behind them, and there is plenty of room for two people to stretch out comfortably. It’s a simple life, eating light easy meals, picking up just enough groceries for a few days, doing laundry when you get to a sizeable marina. Life is easy. Life is good. Last week, as we were out enjoying a lovely sail, the wind began to shift and pick up. We took one sail down and the wind got stronger, so we decided it was time to head back to the marina. As my partner reached down and over to pull the cord to start the motor, a rogue wind caught the main sail and sent the boat onto its edge. I was at the helm and the tiller flew out of my hand. I had the sudden image of my partner going headfirst into the water with me not far behind. 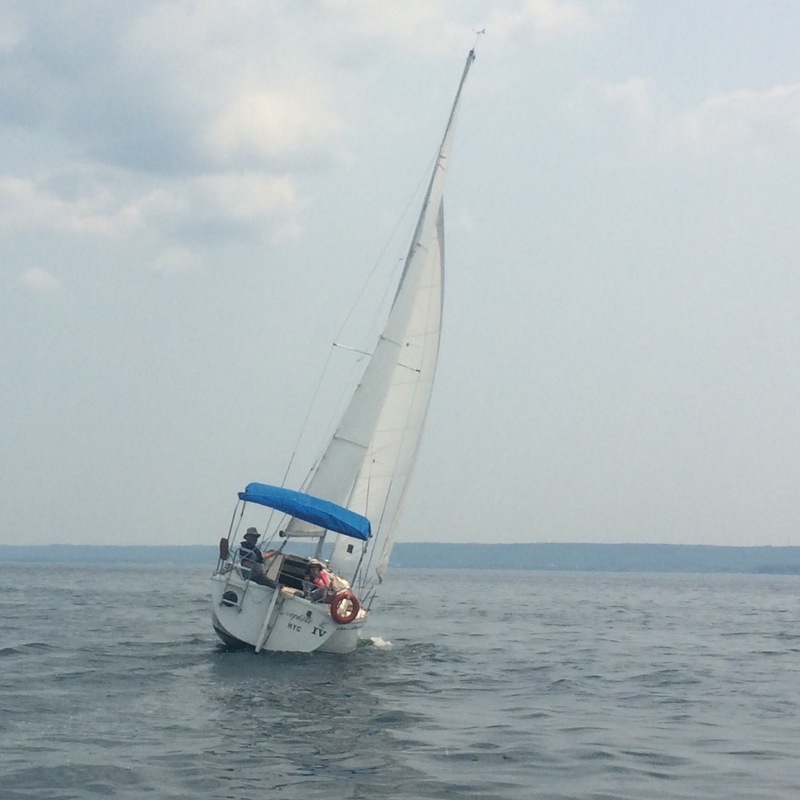 In my panic, I said some unprintable things very loudly, while he calmly reached over and let out the main sail. The boat righted itself with ease. Under normal circumstances, I know to do that. But in the midst of momentary chaos, apparently my mind takes a leave of absence. Guess I’m still learning! Aren’t we all?